EMERYVILLE, CA--(Marketwired - Apr 17, 2015) - Elemental LED, a Bay Area LED manufacturer introduces SWITCHEX, the next step in LED control to its Diode Led product line. 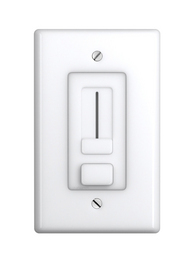 SWITCHEX combines an LED dimmer switch and LED power supply into a single integrated unit. 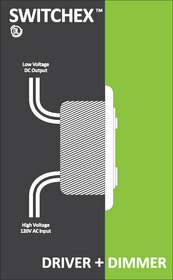 The SWITCHEX Dimmer-Driver accepts 120 Volt AC and converts it to low voltage DC, all within a standard electrical box. With power options up to 100W, it is a true evolutionary step forward for power and control of LED applications. SWITCHEX boasts a contemporary style expected from a premier wall dimmer, but inside is something never before available. It contains an integrated driver that converts 120 volt AC to either 12 volt DC or 24 volt DC. Electricians and inspectors will find its UL Listing and FCC certification meets Class 2 requirements. Installers and customers will appreciate the quicker installation times and lower labor costs. Customers are no longer required to buy a separate LED power supply and a dimmer switch to power and control low-voltage LED lighting. Now, with fewer components, a stylish, simplified installation with excellent dimming performance is possible. "SWITCHEX was designed to solve two of the most common challenges with LED lighting installations," said Andreas Dankelmann, Vice President of Engineering. "First, SWITCHEX solved the poor dimming performance that often results when a Dimmer Switch and LED Driver are made by different manufacturers. The second challenge solved, was making it small enough to fit a 100 Watt driver and dimmer switch a standard electrical box." Four different SWITCHEX models offer the optimum voltage and wattage for LED lighting installations requiring dimming; 12V - 40W, 12V - 60W, 24V - 60W and 24V - 100W. Three interchangeable faceplate colors are included in each SWITCHEX box allowing customers to choose the look that matches their installation decor. Included faceplates are; glossy white, glossy light almond and glossy brown. Elemental LED created SWITCHEX as part of the Diode LED Product line. It will be available at select local Electrical Distributors and Lighting Showrooms May 2015. Learn more about SWITCHEX at www.DiodeLED.com/switchex for specifications and availability. To see SWITCHEX for yourself, Diode LED dealers can be found through the dealer locator service on the Diode LED website www.diodeLED.com/where_to_buy/. For more information or questions, including lighting compatibility and detailed specifications, call (877) 817-6028 or visit www.DiodeLED.com. About Elemental LED: Elemental LED is the recognized U.S.-based leader in innovative LED solutions. We partner with our customers to understand their needs and deliver tailored products, services, and education. 'We make it easy.' We are dedicated to helping customers understand, adopt, and benefit from LED lighting solutions through our combined LED lighting technology, customized product portfolio, and extensive support services. The SWITCHEX(TM) Dimmer-Driver accepts 120 Volt AC and converts it to low voltage DC, all within a standard electrical box. Four different SWITCHEX models offer the optimum voltage and wattage for LED lighting installations requiring dimming; 12V - 40W, 12V - 60W, 24V - 60W and 24V - 100W. Three interchangeable faceplate colors are included in each SWITCHEX box allowing customers to choose the look that matches their installation decor.